AVAILABLE ONLY from UK Sellers, FAT GRABBERSTM is an ideal product for anyone wanting to absorb less fat from their everyday diet. 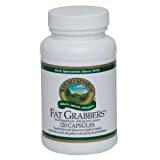 Fat GrabbersTM combines the high-quality fibre found in Guar Gum and Psyllium Hulls with Chickweed and Lecithin for a unique formula that traps fat molecules. No stimulants, no questionable ingredients – just wholesome nutritional substances that won’t disrupt normal body processes. Take four capsules with a meal three times daily. Drink plenty of water. Using Fat GrabbersTM in conjunction with a healthy, well balanced daily diet plan can help you to create an effective overall weight-management programme. This entry was posted in Buy Supplements and tagged GRABBERS, Management, Support, Weight by TOSMS. Bookmark the permalink.